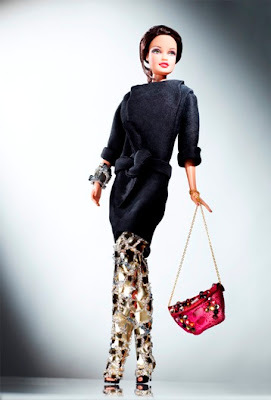 Barbie, as most collectors know already, is no stranger to real-life designers making outfits for her. She celebrated her 50th Anniversary last year with a spectacular runway show at New York Fashion Week. 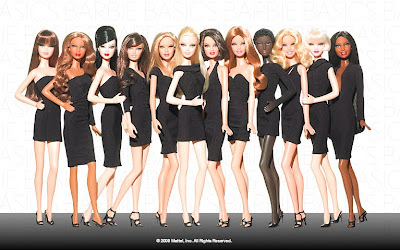 Mattel recently introduced the Barbie Basics dolls, who come wearing little black dresses, have various skin colours and haistyles. Five acessory kits were also introduced to allow the owners to personalize their look. 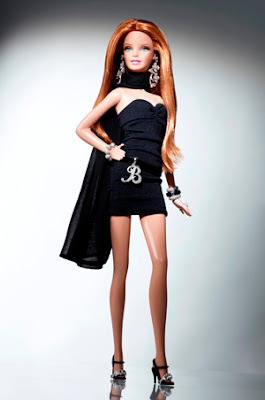 To celebrate the launch, 12 of the top CFDA designers have dressed some of these basic Barbies: Tory Burch, Isaac Mizrahi, Rachel Roy, Justin Giunta, Lorraine Schwartz, Alexis Bittar, Monica Botkier, Deborah Lloyd of Kate Spade, Philip Crangi, Albertus Swanepoel and Devi Kroell, all gave the perennial fashion doll some stylish garments, recycling their own iconic pieces. Each of the one-of-a-kind dolls will be auctioned off on Ebay. The proceeds will benefit the CFDA Foundation and the organization's scholarship and educational programs. The auction goes live on January 28th at 10pm EST and will run through February 7th. To bid visit Ebay.com. 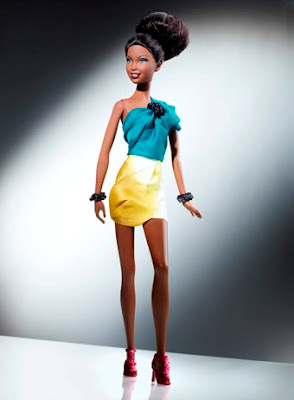 All photos courtesy of Mattel Inc. Thanks! Love your blog too Audrey, jsut put it in my blog list! made a bit more eerie by the fact that the barbie ones are probably also plastic..